In Arequipa, Peru one of the more interesting varieties of Bull Fighting takes place. Here, rather than people fighting bulls, the bulls fight each other. Land owners breed and train these very large bulls from birth for this very event and wager huge amounts of money between them on these battles of toros. How do they get the bulls to fight each other you ask? 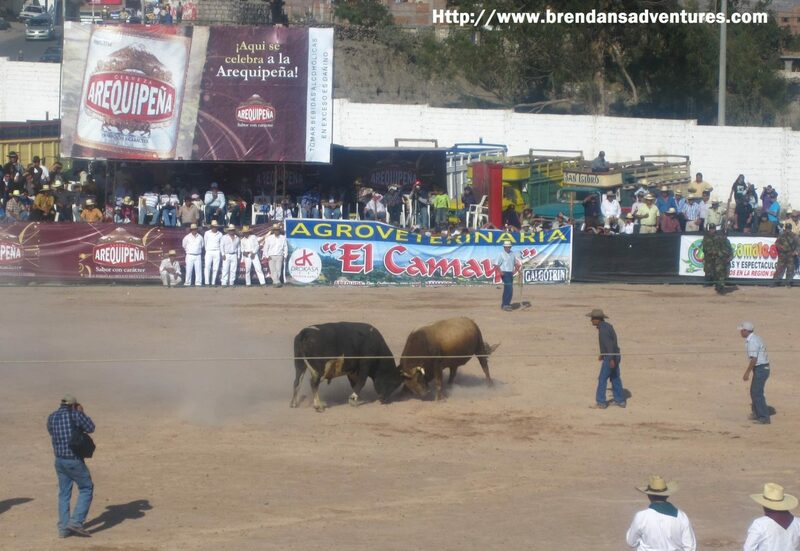 Before fighting they pass a cow in heat between the two of them as they hold the huge toros back. A full story on “Bulls Fighting” will be coming your way soon. This photo just brought back a crazy memory of when I went to a similar event on Sumatra in Indonesia. One of the bulls took off running, broke through the fence and started chasing people all over the village. I had to climb on to a rooftop to get out of its way and I lost money on that fight!